When hardware guys ask how long a hose you want, just say 10-12 feet instead of "half-a-car-length" cuz, MAN, hardware guys are nosy pricks. You'd think movies would prepare you for waking up caked in blood and you can't remember what happened, and you'd be right. This is just ME now. One of these days when I knock the knife off the counter & it DOES go into my foot, the upside will be the ER report that says "ninja" on it. 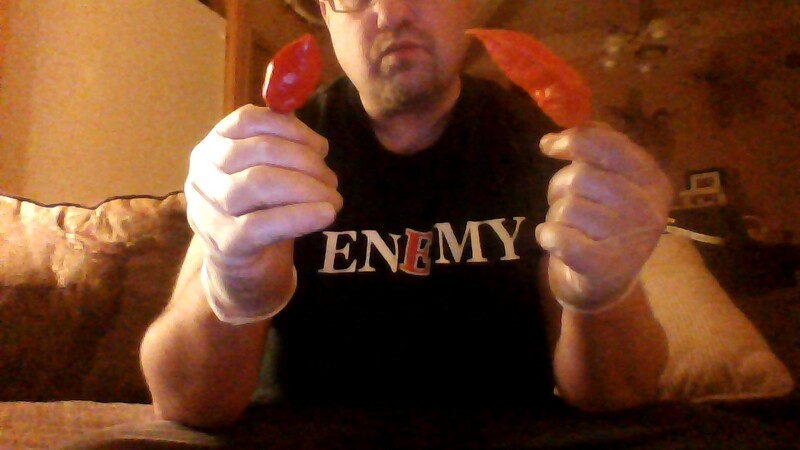 On the left is a Caribbean red habanero. On the right is a ghost pepper. Here is a fun fact: when you cut these things wearing latex gloves, which you're wearing especially because you have a cut on one of your fingers and a rip in your callus on another one, THE LATEX GLOVES DON'T HELP. THEY PEPPER JUICE GOES RIGHT THROUGH THE GLOVES. It is like Alien burst out of John Hurt's chest and escaped and planted peppers on Earth. And I am going to eat the hell outta these things.